194 posts categorized "Air Quality"
A leaked US government memo proposes preventing the scheduled retirement of coal and nuclear power plants for two years. 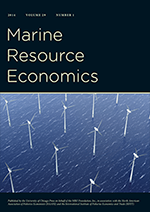 Using a detailed simulation model, we estimate the effects of such a policy on emissions, mortality, and coal-mine jobs. We estimate the effects of a proposed US policy to delay retirement of coal and saveable nuclear power plants that have announced they will close by the end of 2020. The policy would cause 353 to 815 premature deaths in 2019-2020 from additional emissions of sulfur dioxide and nitrogen oxides. The policy would support 790 coal-mine jobs (1580 job-years), though it would be likely to reduce economy-wide employment. These results indicate that each year the policy would cause 1 death for each 2 to 4.5 coal-mine jobs that it supports. If coal jobs earn $80,000 then the Trump administration is willing to trade 1 premature death for a mere $160,000 to $360,000 (and loud cheers at campaign rallies). My read of the literature says that the value of avoiding a premature death is actually larger than those numbers and so this policy is an inefficient allocation of scarce resources. Citing the risk of conflicts of interest, the EPA administrator instituted a sweeping change to the agency’s core system of advisory panels on Tuesday, restricting membership to scientists who don’t receive EPA grants. In practice, the move represents “a major purge of independent scientists,” Terry F. Yosie, chair of the EPA’s Science Advisory Board during the Reagan administration, told the Washington Post. Their removal paves the way for a fresh influx of industry experts and state government officials pushing for lax regulations. The advisory boards are meant to ensure that health regulations are based on sound science, but that role may be changing. As of Tuesday, the new chair of the Clean Air Safety Advisory Committee is Tony Cox, an independent consultant, who has argued that reductions in ozone pollution have “no causal relation” to public health. Quote of the Day: "The fact is places like Ohio were getting dramatically cleaner anyways"
As President Donald Trump signed an executive order Tuesday easing environmental regulations, he said to coal miners standing nearby: "You know what it says, right? You're going back to work. The announcement could have mixed effects in Ohio, where cheap natural gas, mechanization and competitive renewable technologies have contributed to an industry-wide move away from coal. "That's going to happen no matter what. That's just economics," said Brent Sohngen, an environmental and resource economist at Ohio State University. "The fact is places like Ohio were getting dramatically cleaner anyways. This just makes it 10 percent slower, 20 percent slower." Brent is a colleague here at Ohio State. He is also conservative (for an academic environmental economist), studies climate change, and has won a Nobel Prize*. *Nobel Peace Prize...along with 1500 of his close colleagues as a member of the IPCC writing team. "Improvements in US Air Pollution"
The US government passed its first Air Pollution Control Act in 1955, but the major amendments to that law passed in 1970--including the creation of the Environmental Protection Agency to administer the law--greatly expanded the federal and state enforcement efforts. 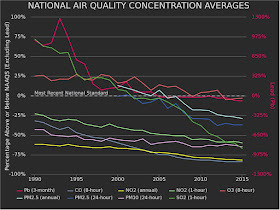 The EPA has published a web report called "Our Nation's Air: Status and Trends through 2015." It's been common since 1970 to refer to the six "criteria" air pollutants, which include carbon monoxide, lead, nitrogen oxides, ozone, particulates, and sulfur dioxide. 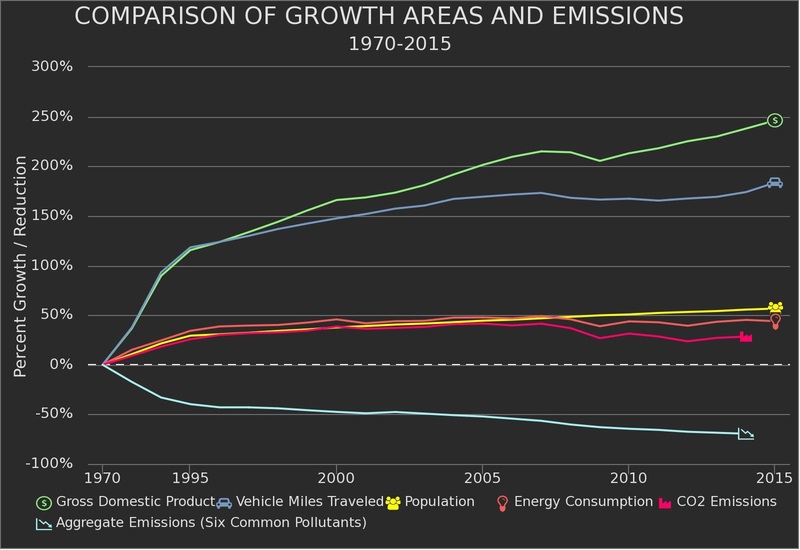 The lines on the graph, from top to bottom, show the rise since 1970 in US GDP, vehicle-miles traveled, population, energy consumption, and carbon emissions--and the fall in the overall emissions of the six criteria pollutants since 1970. Here's more detail since 1990. On this figure, the vertical axis shows the level of various measures of the criteria air pollutants relative to the National Ambient Air Quality Standards (NAAQS). 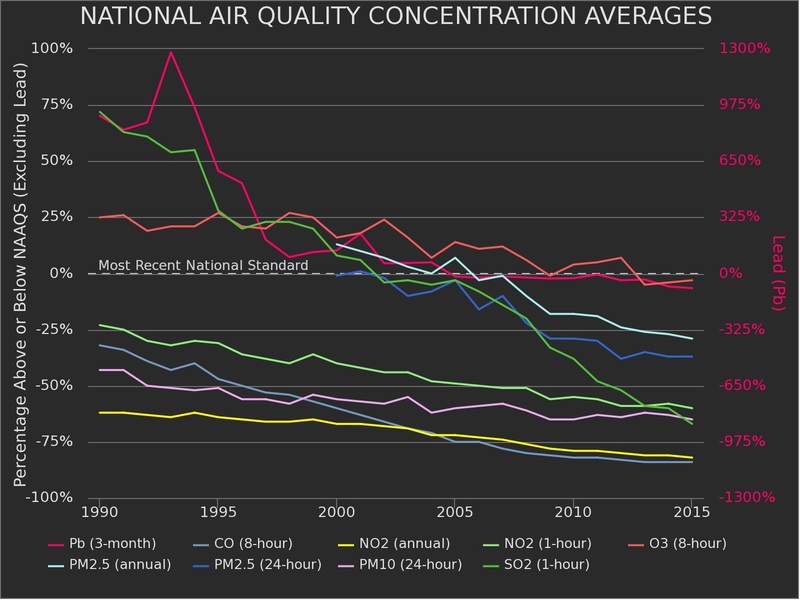 These air pollutants are below the national standard, and falling since 1990s. ... In my experience, this kind of news tends to produce extreme and opposing reactions, either self-congratulatory or self-flagellatory. The self-congratulatory view points to the progress. The self-flagellatory view had no trouble pointing out shortcomings. The reduction in air pollutant emissions might have happened sooner, or at lower cost. There are hot spots of air pollution across the country where air pollution is often above these levels. The criteria pollutants don't include carbon emissions. The self-congratulatory sometimes point to this progress as an argument that efforts toward cleaner air can be relaxed; the self-flagellatory argue that past progress is a reason to accelerate such efforts. At least for today, I'd like to step out of that dichotomy and just emphasize that economic growth in high-income countries can, at least in these important cases, happen together with outright reductions in air pollution. Given that air pollution is the world's biggest health hazard, according to the World Health Organization, this is potentially very good news. The self-flagellatory (why do I feel dirty when I type that one?) argue that past progress is a reason to continue to find economic incentive-based policies that can lower costs. I'm not sure where that last concern comes from [that improving air quality will lead to reductions in economic growth]. 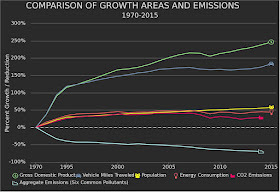 I thought that the experience of the 1970-1990 (improving air quality correlated with positive economic growth) confirmed that improved air quality is not inconsistent with economic growth. The real concern is whether regulations that lead to improvements in air quality slow down positive economic growth (e.g., 2% growth with clean air, 3% growth with dirty air). I would say that in the short run this is so -- regulations that lead to air quality improvements slow down positive economic growth. But in the long run the health improvements have positive feedback effects (e.g., labor productivity) so that the hit to economic growth is less negative or even positive. But, as always, the bigger question is whether the benefits of air quality improvements are greater than their costs. I think that this has been shown to be the case for the U.S. in a number of studies (Freeman, 2002). A few weeks earlier, according to the complaint, a senior VW attorney advised multiple employees that a litigation hold was about to be issued, making it impossible to destroy or delete documents. A team of at least eight employees, all in the departments involved in designing the defeat devices, then deleted or removed data from the company records. “Some, but not all, of the data has been recovered,” the lawsuit said. At the same time VW’s Management Board, the nine men who had presided over the perpetration of fraud, the cover-up and then a public relations debacle that followed its exposure, were awarded $70 million in executive compensation for 2015 alone. I wonder if someone will say the same thing 100 years from now? “The fact that we’ve made a global choice to do something different and the planet has responded to our choice can’t help but be uplifting,” she says. SUMMARY: The Environmental Protection Agency issued an updated cost analysis, defending its issuance of the first-ever federal regulations requiring power plants to cut mercury emissions and other air pollutants. CLASSROOM APPLICATION: Students can learn about the estimated costs and benefits of the EPA's new mercury regulations. 1. (Advanced) What are the benefits to people of reducing mercury emissions? What are the costs? 2. (Advanced) What is the effect of the new mercury regulation on electricity prices? Are households made better off by the combination of the mercury regulation and the higher prices? 3. (Introductory) Is a new regulation justified if the benefits outweigh the costs of the regulation? The Environmental Protection Agency Friday issued an updated cost analysis, defending its issuance of the first-ever federal regulations requiring power plants to cut mercury emissions and other toxic air pollutants. The agency’s move was prompted by a Supreme Court ruling last year that said the agency hadn’t taken into account the costs to industry, as it was required to do, before deciding to adopt the rules. The Supreme Court, in a 5-4 opinion last June, said the EPA must reconsider the mercury rules because of that omission. The rules, however, have remained in effect during that process. The EPA says that power plants are the single-largest source of U.S. emissions of mercury, a neurotoxicant that can be particularly harmful to children and unborn babies. The EPA initially adopted the mercury rules in 2012 and they took effect in April 2015. The agency initially concluded that costs weren’t a relevant consideration when it was deciding on the need for the mercury regulations. Later, as it was writing the rule, the agency estimated an annual cost to the utility sector of $9.6 billion, compared with public-health benefits of at least $37 billion. The Supreme Court, however, said the agency should have made that calculation earlier, as it was deciding whether to adopt the rules in the first place. In its updated analysis released Friday, the EPA listed three figures it said supported the case for regulating mercury emissions from power plants. It said utilities’ compliance costs would be a small fraction of their overall sales and their capital expenditures, and wouldn’t make electricity prices rise unduly for customers. The estimate specifically applied the costs to the ongoing expenses of utilities and consumers. It found that the annual cost of complying with the rules would come to between 2.7% and 3.5% of annual electricity sales (relying on figures from 2000 to 2011). It said the capital costs of complying represent between 3.0% and 5.9% of annual power sector capital expenditures over 10 years. And it said the rules would raise electricity prices 3.1% over 10 years. Most utilities have already complied with the rule, making Friday’s analysis more important for legal rather than substantive purposes. In one sign that stakeholders have moved on, EPA received just 39 comments as it prepared the updated analysis, compared with nearly one million comments when the rules were being written. Some industry trade groups had argued that mercury rule would prompt blackouts and skyrocketing electricity prices. Neither scenario has materialized, due largely to the increased production of natural gas, which unlike coal produces no mercury and whose price has dropped sharply since 2008. Here is a link to a previous post (where you can find more previous posts) on the mercury rule. It seems as if the EPA should have done the benefit-cost analysis ex-ante. But when they did the study the power plants should have said "better late than never" and moved on. The court case and the reanalaysis seem like an enormous waste of money. The updated finding won't put an end to the continuing court fights over the rule, which has helped push dozens of coal-fired power plants to shut down. The Supreme Court is considering a petition from 20 states led by Michigan that argue the rule should have been scrapped entirely and that a lower court's decision to keep it on the books was illegal. Last month, the states argued that the move to keep the rule in place "effectively thwarts" the Supreme Court's decision rejecting the mercury rule. Even if EPA issued its new finding to bring it in line with the Supreme Court's 2015 decision, "EPA never had authority to impose it in the first place," the states wrote (Greenwire, March 18). The Obama administration's response to the states' Supreme Court petition is due May 6. The justices will then decide whether to hear the states' appeal. They could dismiss the request in a short order. Here is EPA's Mercury and Air Toxics Standards website where you can find all of the technical documents. The ex-post ex-ante Mercury Rule benefit-cost analysis might appear today! EPA spokeswoman Melissa Harrison ... confirmed that the EPA next month plans to finalize a fix to the rule to retroactively apply its cost-benefit analysis in the way the Supreme Court said was necessary. The court ruled last June that the EPA should have conducted a cost-benefit analysis on the regulation before it even decided to start writing it. The agency did so as part of the regulatory process, but the justices said that was not sufficient. The Obama administration is one step closer to putting out its fix for its major power plant pollution rule that the Supreme Court said was illegal. The White House Office of Management and Budget approved the Environmental Protection Agency's (EPA) measure to fix the rule Thursday, a day before the deadline the EPA gave itself. The problem with the mercury and air toxics rule, the Supreme Court said was that the EPA should have considered costs and benefits before it even started writing the rule, not just in the process of writing it. So the EPA has proposed to simply apply its existing cost-benefit analysis -- which shows benefits outweighing costs by nearly 10 to 1 -- to the earlier part of the rulemaking process. Keep an eye out for the fix Friday. I eagerly await the "Friday fix."